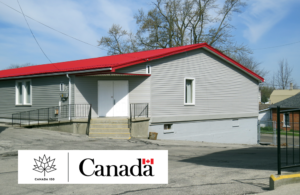 The Norfolk County Agricultural Society wishes to extend our appreciation to the Government of Canada for its $21,476 contribution to upgrade exterior finishes including a new steel roof, replacement windows on the upper level, and new siding on the south exterior wall. This project is funded in part by the Government of Canada, with support through the Canada 150 Community Infrastructure Program/Avec l’appui du Programme d’infrastructure communautaire de Canada 150. A favourite in the community for “Buck & Doe” engagement parties, this versatile facility was renovated in 2004 and offers 3 rooms that can accommodate the most demanding social or business event. The main room is a 4500square foot (50×90) Banquet/Meeting Hall complete with a kitchen along with tables and chairs for 300. Decorative window treatments provide for a cozy location for any reception. The second room is a more intimate space of 900 square feet, that is the ideal setting for meetings, small receptions and displays. Our third room is about 5000 square feet of storage and office space located in the lower floor of the building. Street level access makes it ideal for temporary offices, storage and utility.